Blind Dog Support: For Owners of Blind Dogs – A community site providing support for owners of blind dogs. 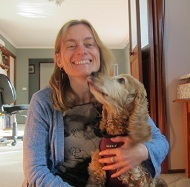 I want to welcome you and your doggy friend to the Blind Dog Support website. When my dog went blind, I found that there really wasn’t one place where I could go to get help and information as well as interact with others at the same time. Some of the blind dog sites I found were excellent but they were old and no longer being updated and I wanted the latest information I could get without having to spend hours scouring different sites for the information I was after. I then realized that like me, others would be experiencing the same thing. So I decided that a place was needed where we could all come together to meet and chat about the issues we are facing with our dogs as well as a place where owners could help and support each other and find plenty of information to help them deal with their dog losing its sight. Help, My Dog is Blind! If you’re reading this, then it is most likely that your dog has just lost its sight or you have been told that it may lose it in the future. Let me just say right now that I know what you are going through. 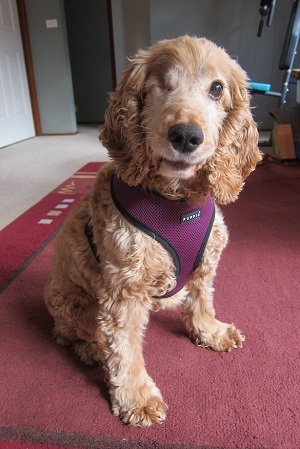 My dog Lucy had one eye removed in December 2011 due to glaucoma and went blind in the second eye within about 6 months of losing the first. So I feel for you right now but what I can also tell you is that there is light at the end of the tunnel, so don’t panic. When my Lucy lost her first eye and the vet told me the same thing would most likely happen with the second eye, I was devastated because I actually thought that a blind dog had to be put down. Little did I know that thousands of dogs that have gone blind live happy contented lives. Mine did and so will yours. So if you are thinking of euthanizing your dog or giving your dog away then can I just suggest one thing….give it 6 weeks before you make the decision. I can guarantee that after the 6 weeks you will see how easy it all is. Your dog will cope beautifully and you will as well. It isn’t that difficult. Sure you might have to make a few adjustments but it won’t be anything major and it won’t involve any major lifestyle changes. The only major change I made (if you could call it that) was to remove the coffee table in my lounge room. The edges were just way too sharp, and were just at her eye level. Now I have a nice big lounge room so there are benefits in that as well. You might also need to do a little bit of training just to teach your dog some new words, like ‘step up’ and ‘watch out’. But you will find that they will come naturally as you interact with your dog. You may find your dog walking into just about everything in your house as it learns to adjust. For my Lucy, it seemed like she had a magnet in her, if there was something in a room that she could hit, then she would find it. For some reason, she would walk diagonally across a room so she might hit a table leg and then head off in the other direction and hit the computer desk, and then head off again and hit a wall. So she might hit five or six things before she actually got to me. Fortunately she got over this within a week or so. She had to otherwise she was going to have one big permanent headache. The one main thing I can tell you is to not pamper your dog. The more you try to do things for your baby, the longer it will take them to adjust. Let them find their way around the house. Just ensure that anything that has sharp edges or is likely to cause damage is removed or padded. This also applies to your garden. They will map it out pretty quickly and it may take a couple of weeks before they stop bumping into things but you will notice a big difference in a short period of time. What personally got me through it all was reading other people’s stories about their blind dogs. If other people were doing okay with their blind dog then I could too. So you can start by reading Lucy’s story here. We’d also love you to add your own story to the site. You can do that here. Also if you register for this site you can ask questions on the forum, chat to other members on their wall, provide your own updates on your dog’s progress and add photos and videos of you and your dog. Click here to register. Just stay happy and know that your dog will be fine. With you, their loving owner beside them, they can’t go wrong. UPDATE: In February 2013, my Lucy succumbed to cancer. She was an amazing dog and we miss her dearly. Although I no longer have a blind dog, I am dedicated to keeping this website working for those who need it. A member has been contacting other members requesting personal information. Please be aware that this is not authorised by the administrators of this site and the person in question has had their access revoked. We apologise for any inconvenience and realise how upsetting this would have been. It's unfortunate that there are people who are so insensitive to the plight of others. Blind dog owners have enough to contend with. If you receive any emails from any member DO NOT EVER REPLY TO THEM FROM YOUR EMAIL ADDRESS, always log into the site and respond to them there.